crazy things | A man's gotta do what a man's gotta do - have a blog! You are currently browsing the category archive for the ‘crazy things’ category. If mankind is ever to colonize new planets, I just hope that it’s not a Swiss person who gets to choose the new city names, as there is a real risk that even simply assigning numbers as names might turn out to be more creative. At least in the Suisse romande every other village seems to be named *ully. I’d be very thankful, if someone can let me know, if this is due to some funny speech defect of a local duke, or if the suffix “ully” has any particular significance. Ellis Kaut invented Pumuckl in 1961. However, the artist behind the drawings is/was Barbara von Johnson. Pumuckl is a kobold. He doesn’t have any strong gender specific traits but he still is fairly clearly boyish. Von Johnson now wants to create a girlfriend for Pumuckl! If you’re not German, you might not be able to feel the full cultural impact of this idea, but just imagine that the cookie monster only ate salads or that Bart Simpson started to be the top student in his class. I’ve often had lucid dreams in my past before, but I don’t remember anything like the dream I had last night. It started out by me dreaming, that I was dreaming, that I was dreaming, that I was dreaming. Though at the beginning I thought it was reality. Then, as various strange things kept happening, I suddenly woke up, or rather I thought I had woken up (though in fact, I was still dreaming, that I was dreaming that I was dreaming). I was glad that I had found a rational explanation for all those strange things but then other strange things kept happening and I kept asking myself: “How can this be now that you’re awake?” And so I eventually I “woke up” again and in my dream I remembered that I had “woken up” before. Now repeat the whole thing again. Eventually, rather than “waking up” I just became lucid, so I still knew that I was actually dreaming and the inexplicable things didn’t bother me anymore. Two weeks ago, Switzerland experienced a political earthquake whose tremors will be felt for the next years. To understand and “appreciate” the whole situation you need to know (i) that there’s no president or chancellor, who has any significant power, (ii) that Switzerland has been governed by a coalition of the four major parties for the last 50 years, without any significant party in the opposition (… except for maybe the Green Party), and (iii) the government, consisting of seven ministers, is elected by the parliament and the distribution of the seven seats among the coalition parties is agreed before the elections and most of the time the seven “old” members are identical to the seven “new” members. A populist party (SVP), which gets its votes on the right end of the political spectrum, becomes the strongest party in the Swiss parliament for the second time in a row. So far no surprise. 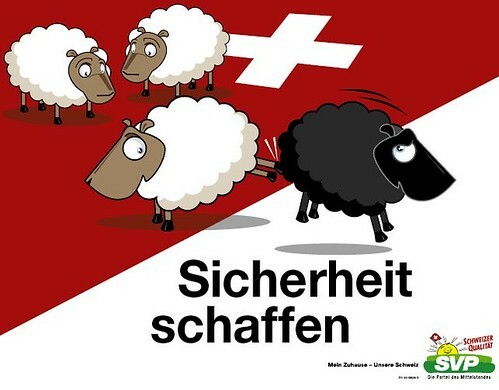 This success was mostly due to its campaign against foreigners (with posters showing three white sheep kicking a black sheep out of Switzerland), spearheaded by its leader Christoph Blocher. So far still no surprise. Now what really was surprising is the following: only one of the seven “old” ministers was not re-elected – Christoph Blocher, the head of the biggest Swiss party. Instead one of his fellow party members, Eveline Widmer-Schlumpf, was elected, without even officially running for the post and while she wasn’t even there for the election. Although he was quite popular among the voters, he did not make many friends outside his own party during the last four years, as he often publicly criticized his fellow colleagues in the government, which is against all rules of Swiss collegiality. Of course, I feel a certain personal satisfaction for his defeat, but he might be able to cash in on his role a martyr now and gain even more votes next year. At least his party now officially entered into the opposition … although they still have two out of seven members in the government!? !